You are here: Home / Blog / Can I insulate a garage door? Can I insulate a garage door? Whether you live in the Florida heat like I do, or suffer through the northern winter cold, there are going to be times of the year when it’s pretty uncomfortable to be in your garage. Every day in the summer, I pull my air conditioned car into the garage, step out into what feels like a sauna (instantly fogging up my glasses) and try to blindly make my way to the door so I can get inside my house to cool off. I only had to do this a couple of times before I started looking for ways to control the temperature in my garage. No fan, dehumidifier or even air conditioning unit is going to be effective, unless there’s insulation keeping the comfortable air where you want it. Can I insulate a garage door? Yes, both new and existing garage doors can be insulated. If you’re replacing an existing garage door, there are doors that have built-in insulation ranging from R6 to R19 or higher. This makes your garage more comfortable, stronger and quieter. You can also add insulation to your existing garage door with insulation kits made of foam or reflective barriers. Think about this: Your garage door is the single biggest non-insulated surface in our home. If you have an attached garage, that means there’s nothing but a thin layer of metal between your home and the outside world. So if you think that thin metal door is enough, then I want you to try something. If you live in the South, put your bare hand on the inside of your garage door in the middle of a hot summer day. If you’re up North, then do that in the middle of winter. This is a picture of my uninsulated garage door at around 8 pm, about an hour after the sun has gone down. The white lines you see are the edges of my garage door and my trash can on the bottom left. Specifically, this angle shows the left side of my garage door and the surrounding concrete wall above it and to the left. A thermal image looks at the amount of heat radiating from the surface of an object. The reds, yellows and oranges in this picture are higher temperatures than the surrounding blues and purples. Even an hour after sunset, the garage door is still hotter than the surrounding wall because metal is a better conductor than concrete. Without insulation, that heat gets released back into my garage over time. Think of it as the gift that keeps on giving, but it’s not a gift that you actually want. How hot (or cold) can your garage get? Most people reading this are going to try to keep their garage comfortable in the winter months. It’a never going to snow inside your garage, but a non-insulated garage can still get temperatures below freezing if its cold enough outside. This can cause the water in pipes and hoses to freeze, causing damage to equipment like your water heater or a garage refrigerator. I’ve got the opposite problem in Florida. My garage faces south, so the hot sun is beating down on my metal garage door – essentially turning my garage into a microwave. The temperatures inside the garage are regularly up to 20 degrees hotter than they are outside. 90 degree temperatures outside mean my garage is pushing 110 degrees. What’s worse is that my master bedroom is directly above the garage. The warmer my garage gets, the warmer my bedroom gets and the harder my fans and air conditioner has to work to cool down my house. What do those R-Values mean? 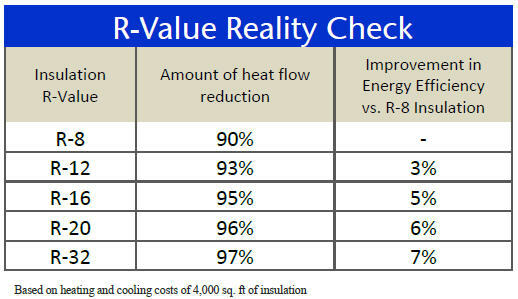 When you’re talking about insulation, the most important metric that you’ll be looking at is the R-Value. The construction industry in the United States has settled on the R-Value as a kind of scoring system for how well a material resists the conductive flow of heat. The higher the R-Value, the better protection against conductive heat. There’s a catch. I mean…of course there is, right? There are diminishing returns as the values increase. An R-value of 16 is not twice as good as an R-Value of 8. In fact, it’s only about five percentage points more effective. So don’t base your purchase completely on the R-Value. It’s an important factor, sure. But it’s not the only one. Should you buy an insulated garage door? According to Realtor.com, replacing your garage door is the single best investment you can make when remodeling your house. A whopping 98% of the cost of a new garage door is recouped when its time to sell – especially if it is insulated! Plus, you get to shave money off your monthly heating and cooling bills while you own the home. A brand new insulated garage door has an R-value between 6 and 19, depending on the manufacturer. One thing to keep in mind that windows, while they make the door look cool, they certainly aren’t cool – at least not in the summer. The door may have heavy duty insulation, but any glass windows would let the sun and heat right though. If you’re in the market for a new garage door, or if you live in an extreme environment (I’m looking at you Arizona), then a brand new insulated door really is a must. It’s not going to make it cool and cozy in your garage if the outside temperature is hitting 120 degrees, but an insulated garage door will cut about 20 degrees off the temperature inside. That can be the difference between uncomfortable and downright dangerous temperatures. Buying a new garage door isn’t necessarily for everyone. It’s not cheap. Estimate about $3K for a quality door once you factor installation costs. Even if you do it yourself, you’re still going to be in the two-thousand dollar range. In my case, my house was a new build so I can’t justify spending money on a new garage door right now. What I really needed were some new garage door rollers, which cost a whole lot less than a brand new insulated garage door. So I wanted to see if there were other options. Can your existing garage door be insulated? It turns out there’s a much cheaper option. It’s not as good (obviously) but its a lot better than nothing for a fraction of the cost. Several companies make garage door insulation kits, which are basically just pre-cut sections of foam insulation that slide into channels on your existing door. There are also reflective foil wrappings (called radiant barriers) that promise to do the same thing. If you don’t want to go the pre-cut method, you can save some more money with rigid foam insulation that you cut yourself. Its not as quick or simple, and it definitely makes more of a mess. But if cost is your biggest concern, then you only have to spend about $50 and a spare Sunday afternoon to do it yourself. Can you use fiberglass insulation on your garage door? You’ve probably seen insulation that’s made of pieces of fiberglass. It’s one of the most popular types of insulation. Oddly enough, it isn’t really used on garage doors. Owens Corning, the Pink Panther company, is the only company I know of to make a fiberglass insulation kit specifically for your garage door. After a lot of research, I wouldn’t recommend to use fiberglass insulation on a garage door. Fiberglass insulation is heavier than rigid foam – almost 50% heavier. That extra weight can put a strain on your garage door opener’s motor, not to mention the torsion springs used to raise and lower the door. If the door is too heavy, you’ll end up shortening the lifespan of the garage door opener. Fiberglass insulation loses its effectiveness when it gets wet. This is the deal breaker for most of the country. A little water damage is OK. They insulation will bounce back as it dries out. If it stays wet too long, the fiberglass may become cemented together and it’ll be completely useless. There are three main types of rigid foam insulation that you could use on your garage door. I’ll highlight each of them here. I won’t get into the science of how they’re constructed, don’t worry. Expanded Polystyrene (EPS): This is the most common form of insulation that you’ll find in garage door insulation kits. EPS has an R-Value of between 3 and 4. Extruded Polystyrene (XPS): XPS is between 10% and 30% more expensive, but more rigid and won’t absorb water as quickly. It has an R-Value of around 5. Polyisocyanurate (polyiso): This has an R-Value of just under 7, but it’s also the most expensive rigid foam insulation. The relatively light weight of rigid foam insulation makes it ideal for most residential garage door applications. If you’ve walked through the insulation aisle of your local Lowe’s or Home Depot, you’ve probably seen these rolls of reflective foil that look like something straight out of NASA. That’s not too far off actually. They’re called radiant barriers and what they do is reflect heat waves back on the source. It’s a similar concept to the heat shields on the bottom of the Space Shuttle that reflect the extreme atmospheric heat away from the spacecraft. I’ll bring it a bit closer to home for you. Have you ever stood next to your garage door (or anything else super-hot) and felt the heat without even touching the surface? That’s the heat waves radiating off the surface of the door. Radiant Barriers don’t have much in the way of an R-value. That’s not really how they work. Remember, R-values measure resistance to conductive heat (touching the surface). 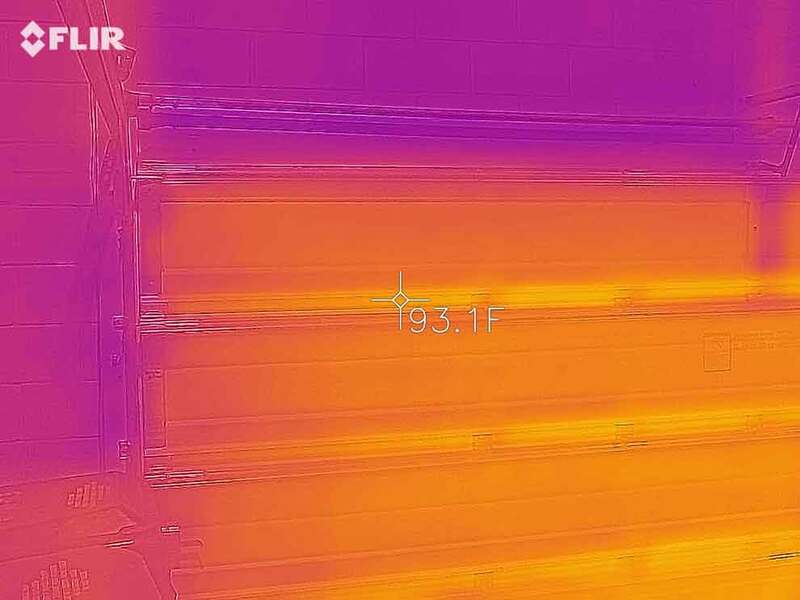 Radiant barriers are great at reflecting heat waves back, but they can’t stop temperature increases from the hot (or cold) air all around your garage door. One big catch (see? again with the catches) is that radiant barriers need an air cavity next to their reflective side. If you glue the reflective foil right up against the metal of your garage door, it will lose effectiveness. The best of both worlds approach would be to use a radiant barrier in conjunction with a foam or fiberglass insulation, so their benefits stack. Do garage door insulation kits really work? Obviously a $100 garage door insulation kit isn’t going to be as effective as a $3000 insulated garage door. But is it good enough for most people? I’ve picked up the Matador foam insulation kit and I’ll be installing it shortly. I also bought a radiant barrier to use on the inside of the door, hopefully to keep some of the cooler air inside my garage. I’ll post all of the installation details, as well as before and after tests with a digital thermometer. Durability: I remember playing with pieces of foam as a kid, turning them into swords or anything else that my imagination could come up with. Foam always starts out rigid and strong, but with enough movement it’ll break down. Since the garage door is never going to be still, I worry that the foam can stand up to daily use. Weight: Foam is lighter than fiberglass, but it still adds more weight to the system than was intended. This may cause issues for the garage door opener and the other hardware. How much will it cost to insulate my garage door? It depends which way you want to go, to be honest. A brand new insulated garage door will set you back between $2,000 – $3,000 by the time you get it installed. Sure, it’s going to add most of that to the resale value of the house, but that’s still a lot of money. By contrast, adding a garage door insulation kit will only set you back around $200 for a kit, or about $50 and an afternoon’s work if you’re doing it yourself. To me, the choice is clear: Unless you’re already in the market for a brand new garage door, go for one of the garage door insulation kits (or the DIY version). Adding it to your existing door may do enough to make your garage more comfortable during the cold winter or hot summer months. If it doesn’t work as well as you wanted then you can still spring for the insulated door down the road, but you’ve bought yourself a little extra time to save a little money and find a good deal on a new insulated garage door.